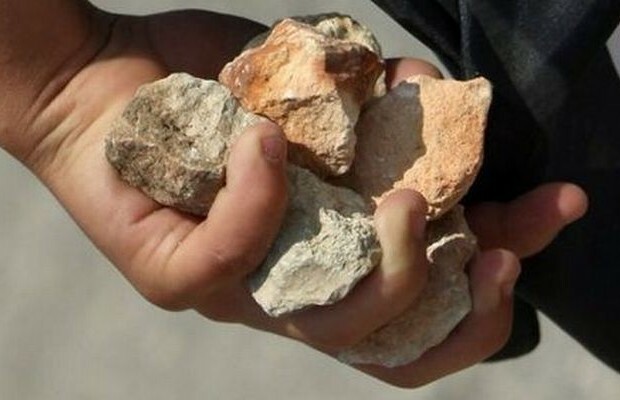 Because of recent events, I have to admit my hands have been full of rocks. I’ve wanted to throw them at certain people for quite some time now. Every night after spending a short time scrolling down my FACEBOOK wall, I was adding names to my list of people who I felt needed a stone chucked in their direction. I was getting rather upset. My hands were packed full of rocks and I had quite a pile of them at my feet just waiting for me to pick up. To say that I was ready to begin catapulting them across the wide spectrum of people I disagreed with would be an understatement. Many of my rocks were destined for those I have serious differences with. Particularly with those that have different beliefs than me. But some of these rocks I held were intended for some fellow believers. Specifically those fellow believer’s that are part of the ill-defined segment known vicariously as “Christian Millennials”. Many of whom choose to take an opposing side of issues that are not in line with how they were raised. Many turning their back on the very foundational principles that their parents taught them and then they spend most of their time and thoughts on bashing (throwing rocks) at this same foundation. Many taking joy when a fellow believer fails in their Spiritual walk. Defined as those that are 24 to 36 or so, depending on who you read. They’ve been called the “Me, Me, Me Generation” by Time magazine. There is a common belief that they feel “entitled” by just about everyone. The bottom line is that these “millennials” believe they are right on just about every question of life. Even if they do not think they are right, they just know that you are wrong. And they are leaving the church in droves. Now it would appear that I am making too broad of a statement and painting a picture that all people in this group are the same… they are not. Many are searching for the truth and the church truly does need to find common ground with them. Also, before I come across as just throwing judgmental hand grenades at them, please read this to the end. So there are 80 million millennialists (give or take) in the U.S.—and approximately the same number of suggestions for how to bring them back to the church. But most of the proposals I’ve read fall into two camps. The first goes something like this: The church needs to be more hip and relevant. Drop stodgy traditions. Play louder music. Hire pastors with tattoos and fauxhawks. Few come right out and advocate for this approach, but it is clear they do not want their parents church. Others demand a more fundamental change. They insist the church soften it s positions on key doctrines and social issues. They say, our culture is secularized. Let’s get with the times in order to attract the younger generation, they say. Let’s marginalize God and/or Jesus Christ as simply our “buddy” to help us out (with a wink and a smile) when we are in trouble and that everyone can live their life as they wish regardless of eternal consequence. They believe we must abandon core beliefs and restrictive moral teachings of the traditional church. They believe the Bible is intended as a guideline, not necessarily absolute truth. They tend to question every story found in the Bible. It surly could not have happened the way the Bible said it did and if you do believe the Bible as fact, you are a racist, bigoted, hypocritical, uneducated homophobe. More importantly… you are just plain wrong. I have issues with both approaches. I want a pastor that is relevent and up to date with the issues of life for all members of my church. I want him to be aware of current events but he doesn’t have to look like me. He shouldn’t have to look like them either. Chasing just the “coolness” factor at church won’t work. I have horrible memories of a pastor lecturing me at summer camp when I was a teenager about the evils of a rock band that had not put out an album in 10 years. He came to the “service” dressed like me and tried to use language that he thought would relate to me. He had no clue and more importantly he was trying to relate and be “cool” but failed miserably. 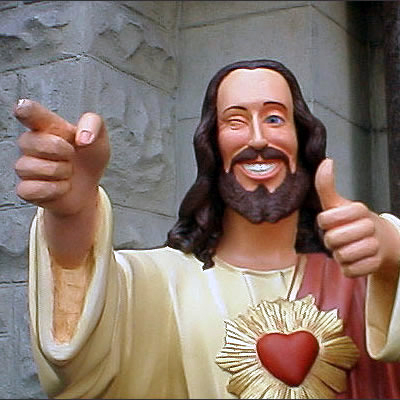 In my experience, churches that try to be cool end up with a pathetic facsimile of what was cool about 5 years ago. No one wants to see a 60-year-old pastor acting like he is 25. It never comes off well. Does this mean that a pastor is “done” in his ministry in his 50’s or heaven forbid his 40’s? What will be “cool” when these “Christian Millennialist’s” turn 50? Will they be as relevant as they present themselves today? I think not. What will these, all-knowing (but have no real life experience) people do when the next generation comes along and has a different way doing things and have their own version of being “cool”? Will they see error in their ways? Or will it be too late to even matter? The second tack is worse. Not only will we end up compromising core beliefs, we will shrink our churches as well. The advocates of this approach seem to have missed what happened to mainline liberal churches over the last few decades. Adopting liberal theologies and culturally acceptable beliefs has drastically reduced their attendance. When the premise of your take on Biblical accuracy of truth starts with “God couldn’t have” or “God didn’t” it is a slippery slope to complete unbelief. In addition, I think that in solely conceptualizing God as a nice, kind, “Jesus is my best friend,” lover of kittens and puppies way that we have, we lose some of the reverence for the righteousness of a Holy God. Make no mistake, there will be eternal consequences for the way we live our lives. While I am still coming to terms with how to exactly handle my inner feelings in dealing with them, I still believe that people like me and those of the church need to find common ground with those that carry these beliefs. I had enough. I was tired of seeing these people getting away with throwing rocks at other people who I felt did not deserve the bashing they were receiving. It was now my turn. As I scrolled down my FACEBOOK feed and I was picking up more rocks and taking more names to receive them. I was going to respond to every post I disagreed with. Everyone was going to know what these people were really like. I wanted to embarrass them. I wanted retaliation. I wanted to prove them wrong. I threw a couple of rocks at a few of them. Arguing, I began to tell the Lord that I was justified! They were wrong and I was right and it was important that everyone know! Nope. It was if you’re without sin. Without any sin. Sin is sin is sin. If it’s wrong, it’s wrong. Reminding myself of this story, I let a few stones drop from my hand. I’ve never molested a child or shot anyone or taken something that didn’t belong to me, but guess what? I’m still a fallible human being. I’ve messed up. A lot. I am not perfect and I need grace and forgiveness. I can’t throw that “without sin” stone. Can you? A few more stones fell from my hand to the ground. I need to accept that God will take care of the outcome. It’s not my job. Regardless of my “feelings” or “thoughts”, it is not my job to stone those who I think are wrong. Maybe this is the common ground we need to have. Instead of feeling like we need to throw stones at those we disagree with maybe we all need a reminder of our own sin. It is impossible to be self-righteous when you recognize the sin in your own life. I think we will struggle to judge others when the grace that covers our sin is front and center on your mind. I dropped the remaining stones to the ground. I am going back inside my glass house now. First to wash my hands, secondly to wash my windows because it seems I haven’t been seeing things clearly. Again, I need to accept that God will take care of the outcome. 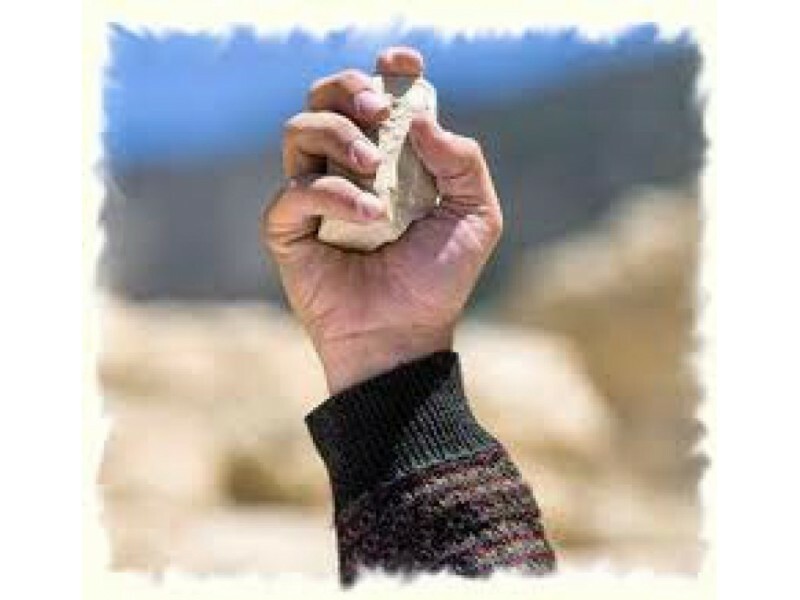 Throwing stones…why does it seem as if everyone is guilty of doing this? Why are we so quick to judge? Whatever you’re thinking of throwing… just don’t. Life is a book of pages. We laugh. We cry. We smile. We stumble. We stand. We fail. We succeed. We win and we suffer loss. Every page defines who we really are. On some level we all “bookmark” the events in life so that we can bri ng them up in our memory to be relived as we move on in life. The goal in life is to have one perfect memory that is all about those moments, big or small, that make you wish they’d last forever. Those moments you want to stop in time, when everything feels perfect, even for just a split-second. Snapshots of the mind. Moments to treasure forever. It is easy to bookmark the great things that happen in our life. We do not struggle to remember the events in our life that are good. We can remember almost every single detail of good life events. Great memories of graduations, engagements, weddings and almost every detail of our child’s life from birth to this very moment. These are easy to bookmark and if we are lucky enough, we are able to put a few of these pages together to create a nice “chapter” in our book of life memories. The sad part is that we all have bookmarked pages of life of things we do not want to remember. Life is full of these bookmarked moments. Life is complicated. It starts before we’re ready, it continues while we’re still trying to figure out the point of it. And it ends before we’ve worked out just what to do. I’ve learned that in an instant life can change. No pause or stop button. Suddenly we are scrambling to “bookmark” memories as fast as we can in our minds. Sadly, I have had to this a few times in my life. My brother Bobby and my grandfather in 1970. Just a few months before Bobby died. 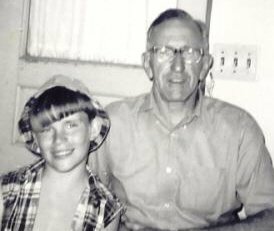 At 9 years old, I had to scramble to bookmark memories of a 14-year-old brother that was taken from our family in a car-train accident. I can remember almost every minute of that fateful day he was taken from us. But I think that over time when we block out the pain of loss, it causes us to lose some of the precious memories. These “bookmarks” have faded with time and now at 54, I struggle to remember him. I lost my grandfather in 1986. I have great bookmarked memories of him. He was a great influence on me and there isn’t a day I don’t wish I could talk to him one more time. The funny thing is that I have some bookmarked memories of him that I choose not to open in my book of life memories. I systematically only open the pages that make him larger than life. I only open the pages that fit the image I have of him in my mind. Those pages of him acting poorly or negatively, although bookmarked, will remained closed and locked. Never to be opened again in the confines of my mind. I guess we all do that on some level. 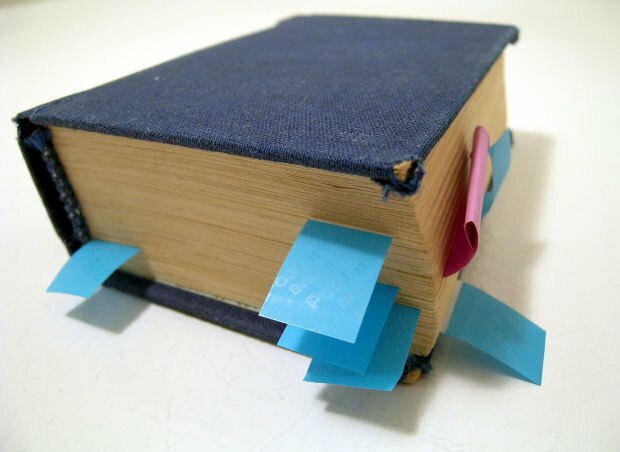 When someone dies, we freely open the “good” pages and quietly put those bookmarks that would taint the memory of a loved one under lock and key. 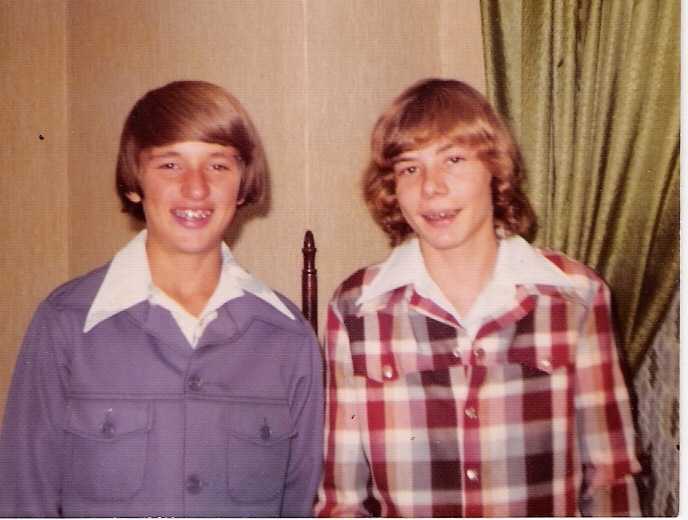 Me and Bryan Blakely in our our “Leisure Suits” getting ready to pick up our dates for the 1975 Homecoming Dance. Many of the bookmarks in my life were influenced by Bryan Blakely, my childhood best friend. The first pillar in my life. The days of my early childhood were influenced by his presence in my life. Not much happened in my life from the age of 5 to 16 that Bryan and I did not experience together. Somewhere along the age of 16, we started to drift into different directions. Over the next 30 years whenever our paths crossed, we would always talk and we knew that there would always be a special friendship between us, but it would never be the same as it was growing up on that alley between Walnut and Washington Streets in Oak Harbor, Ohio. He died in June of 2009. My best friend from my high school years took his own life. 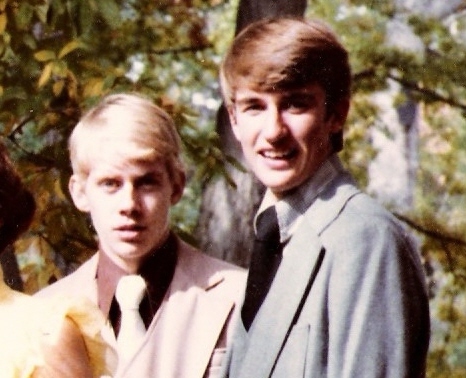 Steve and I during our senior year in 1979. Now that is a bookmark that I would rather not have to open. I was devastated. I was confused. I was filled with questions. I was overwhelmed with regret. I was angry. I was ashamed. I was frustrated. I was hurt. I was all of these things and more. I will forever be grateful for spending 40 years of my life with the pleasure of knowing Steve Schueren. Steve was my closest high school friend. I looked up to Steve and I will always hold him in high regard as a man of God. All the bookmarked memories I have shared with him will forever be cherished and remembered. All of us who knew Steve know that he will live forever in our hearts. About the age of 16, I was introduced to a man who would become so influential throughout my teen and adult years. He grew to be not only be my friend but he was no less a father figure in my life. Our father/son relationship lasted for years. 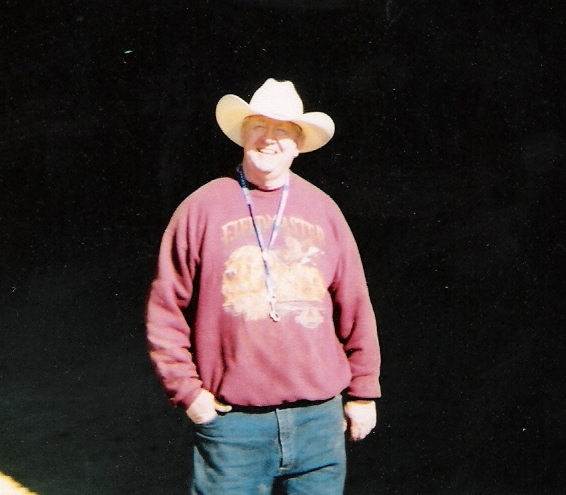 Bob Emrich loved me as a son and he loved me unconditionally. God took him home after a battle with cancer. He wasn’t perfect but he taught me so much and I still miss him everyday. There is no doubt of his influence in my life. Forever bookmarked in my memory. One would think after reading this, I would have this bookmarking thing down. But like most people, I move from day-to-day not really paying attention to how quickly things could change. Why does it take big kicks in the behind for us to realize what’s important in life? Most of the time, I believe, it is because we get caught up in chasing things in life. Whether it be money, materials, certain experiences we think will solve our problems or even people. Sometimes we get so engaged with everything in the future or in the past and what it can bring us, that we forget about all that is right in front of our faces. Are you paying full attention to the things you love? To each moment? What memories have you bookmarked in your memory? I implore you to start with one thing today. One thing you want to experience fully. Maybe something that will be with your wife, husband, your children or grandchildren. Maybe you need to make yourself available to allow a loved one to make a bookmarked memory with you. Remember your children are making bookmark memories of their own with you as well. I realize more and more how incredibly blessed my life has been and I know a good part of that must pay tribute to the people that surround my life, past, present and future. Lives that vary so greatly, the people I went to school with formed a good part of who I am today. The good, the bad and all of the in between! Time goes quickly and some stay in touch more than others, but there’s a bond in growing up in the small town of Oak Harbor, Ohio or in the time spent in a small Baptist Church and Christian School that only those there can understand. I suppose it’s the pros and cons of living with a small group of people that knits our hearts together. The losses that take their toll on such a small community can seem larger than life because of the percentage they take away from the whole. They can feel like holes that are irreparable. But at the same time the wonderful memories of victories are celebrated as monumental events by one and all and are remembered fondly. My challenge is for anyone reading this is to take the time to make memory bookmarks in the confines of the hearts and minds of your family. In turn you will be able to do the same, before it’s too late.